The name Brachyglottis does not actually roll of the lips that well, and just to add to the confusion, some Brachyglottis species have been renamed as Senecio. However they are a useful group of garden plants no matter which name you use. Brachyglottis are are a small shrub, most originally from New Zealand and are related to daisies, they are a tough plant once established. One species is from Tasmania and is regarded as endangered in its natural environment. The popular cultivar Brachyglottis ‘Otari Cloud’ with its silver edged foliage is pictured right. 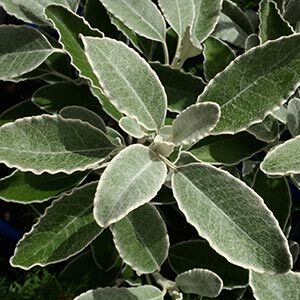 Many species are grown for the attractive silvery foliage, however their is more to the genus than this. Brachyglottis repand ‘Purpurea’ is a prime example of the diversity offered. This variety has large purple foliage with white indumentum on the underside is a great foliage plant that grows well in coastal conditions as long as the soil is humus rich. Brachyglottis compactus is a low growing mound forming species that makes a great ground cover plant. Brachyglottis monroi is a taller growing species. Brachyglottis repanda is a largish evergreen shrub that grows well as an understory plant. White flowers in spring. The Brachyglottis x Dunedin group are a recently developed cross between B. compacta, B. greyi and B. laxifolia, and well worth a place in the garden. B. brunonis is found in Tasmania, a small evergreen flowering shrub that is regarded as a threatened species in its natural habitat. The cultivar B. rependa Pupurea with its large purple foliage with white indumentum on the underside is a great foliage plant that grows well in coastal conditions as long as the soil is humus rich.